Wow, check out this computer! It's a Chromebook 3G, an affordable laptop. If you use the computer to surf the web and use cloud-based apps, this will work great for you! Enter for a chance to win below, then leave me a comment. Thanks! You can easily share it with multiple people; switching accounts takes seconds, and everyone gets their own files, apps and settings. And it's simple to use. There's no setup, and your files are automatically backed up in the cloud. At just 2.4 pounds, 0.7 inches thin, and with over 6.5 hours of battery life, the Samsung Chromebook can go anywhere you go. It's built to stay cool, so it doesn't need a fan and runs silently. It also includes 100GB of free Google Drive storage (for 2 years), a built-in webcam, and dual band Wi-Fi to make it easy to connect to wireless networks. No more waiting for an affordable laptop. Go Chrome Today! 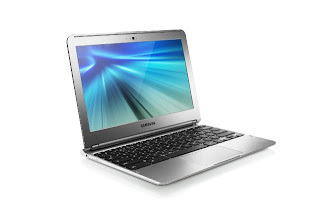 One lucky reader will receive a Samsung Chromebook 3G. Giveaway ends April 10th at 11:59pm, open to US and Canadian residents, ages 18+. To enter please use the Rafflecopter form below. Good luck! I'd replace my old one since it is almost worn completely out from visiting wonderful blogs like yours! I'd enter sweepstakes in my every free second of spare time! Since I don't have a laptop, I would take it with me wherever I went. I would replace my old laptop. I really could use a new laptop. I'd use it for work! Get rid of my old one that gives me grief on a daily basis! I would use it for classwork, homework, and anything else that has to do with community college, since I am now a student, so it would great to finally have my own. I would use it to enter sweeps. Use it for work and school! I would use it for a replacement for my old computer! I would let my son & husband use it so I can use the desktop more often! I would give it to my sister because her computer is on its last legs. I would use it to teach my 2 year old daughter Hannah letters. I would do my work on a laptop! I would love a laptop that is not touched by anyone else in my family!! I would give it to my mom and dad, they don't have a computer at home right now and can't afford to get one. I'd use it around the house to read articles. My knowledge of the workings of a laptop is severely lacking. This would open a whole new world to discover. I would use it for surfing the web to save and make money for my family. Also, I am starting Nursing School May 23rd, so I'll be using it for school. I will use it to save/make money for my family. I'm also starting Nursing School on May 23rd, so I'll be using it for school. I would use it for my thesis writing! I would use it to enter sweeps and keep up with friends. Use it for my favorite hobby, Sweeps & Contests! Keep for myself. Get into the 21st century (finally). I would use it to print coupons! !